I’ve been looking forward to visiting an unagi (freshwater eel) restaurant all holiday. And Bincho in Marronier Gate – at the top of Tokyo Hands department store – was worth the wait. 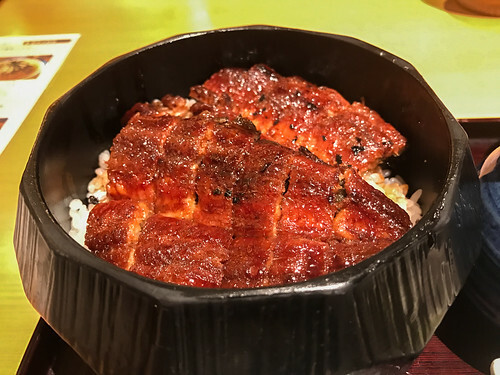 I found it listed under best unagi restaurants in Ginza on the picrumb food blog – a reliable food directory in my experience, and one I recommend. 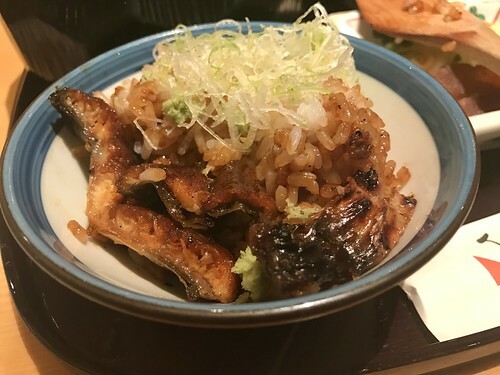 We had hitsumabushi – chopped broiled eel cooked over charcoals with a secret tasty soy flavoured sauce, on top of white rice – really crispy and absolutely gorgeous. Japanese eel is right up there as one of my most favourite foods. 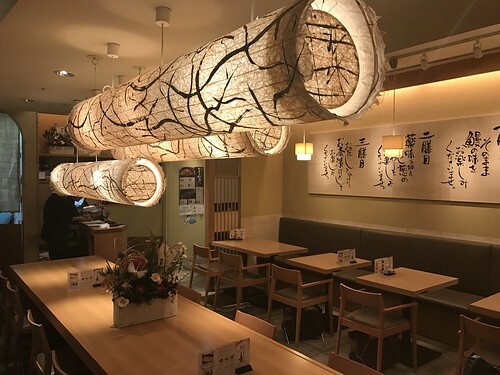 While the interior decor of Bincho is simple, classy, and well, very Japanese in style, the laminated menu and plastic tray might give a European visitor the impression of being a greasy spoon or motorway service station. It’s not. 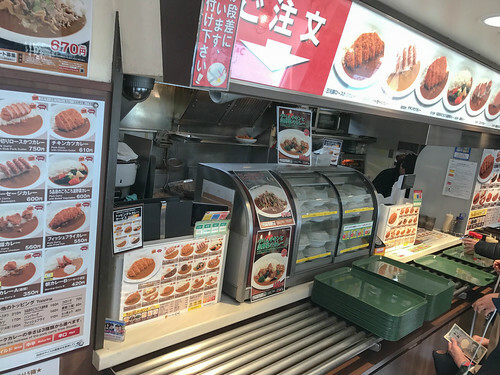 Plastic trays take a bit of getting used to – they might be associated with self-service canteens in the UK but they’re commonplace in restaurants in Japan (keeping food and utentils off the table; keeping things clean and orderly, as with the abundance of food packaging). The verdict: If you’re in Tokyo, visit Binchou. That’s all there is to it. Tsukiji Fish Market is one of the world’s largest fish markets and one of Tokyo’s biggest tourist attractions. Don’t miss it – whether or not you watch the tuna auctions in the early hours, it’s a must visit later in the morning for a fresh raw fish lunch. On our visit earlier today, 4 January 2017, there were long queues coming out of many of the little diners. We chose Maguro Isuke spontaneously, while wandering around, as it looked appealing and there wasn’t much of a queue. 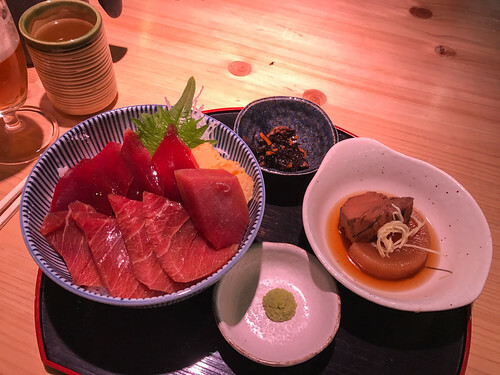 Inside 築地マグロ伊助 Tsukiji Maguro Isuke (maguro means tuna), the menu offers a variety of fresh tuna dishes, along with tempura and yam (another speciality). We order an obligatory Suntory malty lager each, and tatsuta-age (tuna cheek) and cod roe tempura to start. 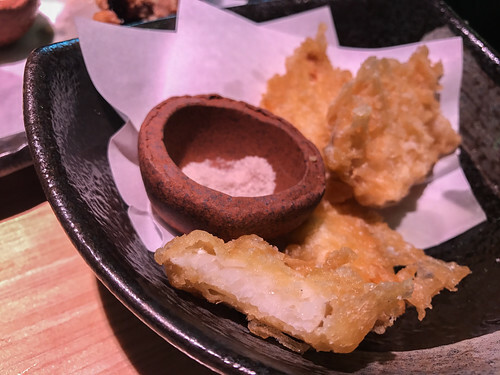 The tuna cheek is really quite meaty and the batter is light, thin and crisp. 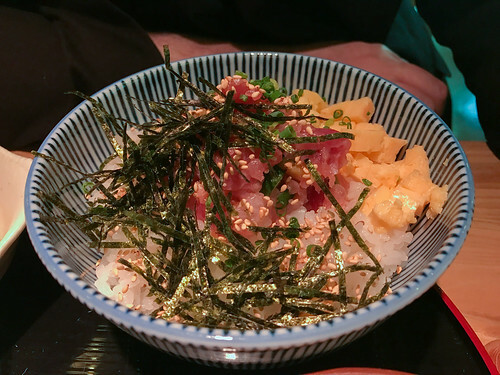 For mains we share マグロ漬丼 ヅケド – a rice bowl with three different cuts of raw tuna, served with pickles @ 1,380 yen (quite literally the freshest raw tuna I’ve ever eaten – there’s even some blood on the rice but don’t let that put you off; it’s exceptional) and 築地めしツキジメ (jinenjo-tsukiji- meshi) – a rice bowl with yam, raw tuna and seaweed @ 1,000 yen. We end up drinking two lagers each. Altogether four lagers total 1,160 yen. 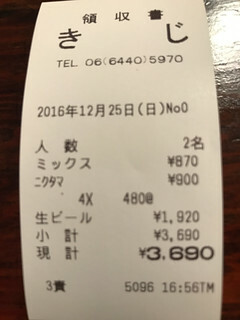 And the total bill for two comes to 5,500 yen (for the likes of menus and bills, the Google translate app comes in handy). That’s just under £40.00. A bargain at £20.00 a head. 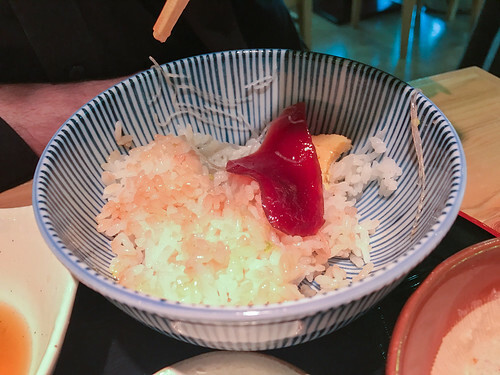 The verdict: Looking at Tsukiji Maguro Isuke’s website now, it says Fresh raw tuna – you’ve never tasted tuna this fresh before! I hadn’t. And it was just stunning. The only disappointing outcome is that I’m probably ruined for finding raw tuna this good back in the UK. This was seriously special; don’t miss it. 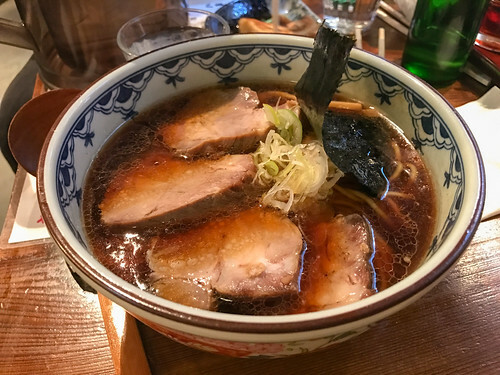 銀座 梵天 Ginza Bonten, a tiny restaurant behind our hotel turned out to be a winner with its beautiful wooden beams and stools, and tasty pork ramen and gyoza. 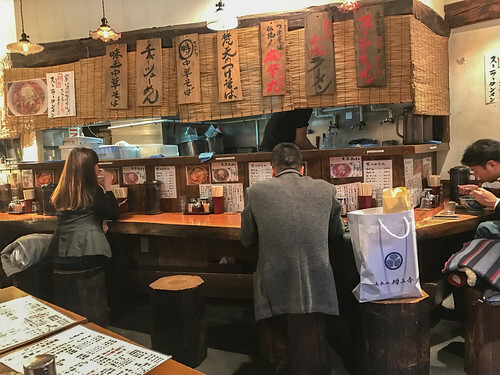 As with many neighbourhood Japanese restaurants, you can’t see inside from the outside so it can be a bit of an adventure, wondering whether you’ll need to take off your shoes on entering then figuring out the food options if English isn’t spoken. Inside, this restaurant only has about 20 covers, most of which are individual stools along the counter. With much bowing, smiling, and pointing on both sides, the host seated us at a corner table. 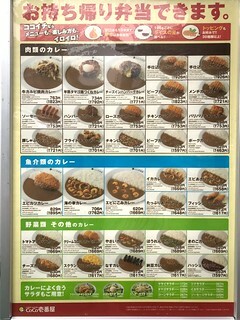 And the Google translate app came in very handy indeed as the menu was all in Japanese. Typical of a local restaurant like this, the menu offers a few variations on a limited number of speciality dishes, and it’s cash only. 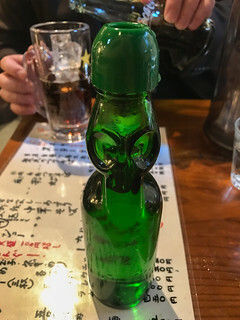 I order some form of fizzy lemonade that turns up in a cute owl shaped bottle (that’s perfect for holding) with a ball bearing lid. Intriguing. 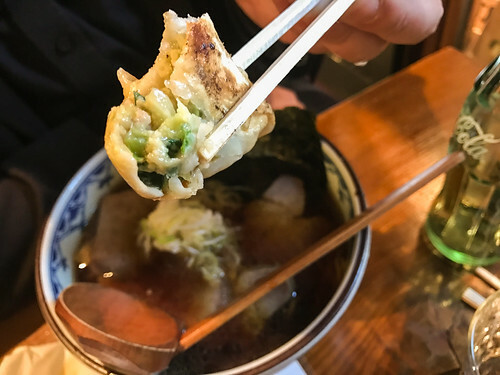 We share fresh, hot gyoza (so, so good) to start, and both have chashu (marinated, slow-cooked, braised pork) ramen. The verdict: Best ramen I’ve ever had, by far. Excellent lunch spot, tucked away from Tokyo’s hectic main shopping streets. 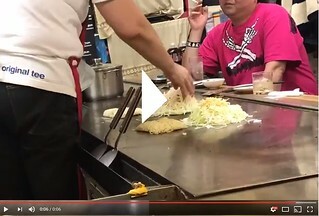 Watch this 11 minute video – Go behind the scenes and see for yourself what’s involved in running a ramen shop in Japan (so much effort – it explains what makes the flavours so special). These cabbage-based savoury pancakes can be stuffed with anything you like, and there are regional variations. 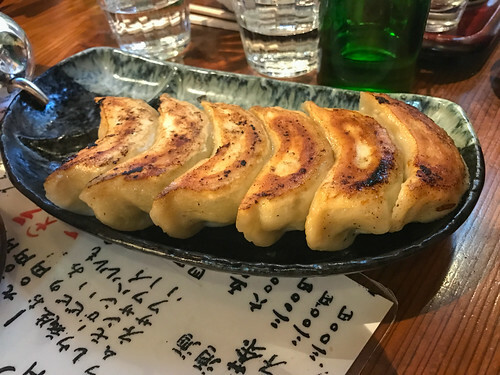 This post looks at two types of okonomi-yaki (yaki means grill) that we ate in Hiroshima and Osaka. If you haven’t tried them before, they’re an absolute must try in Japan. 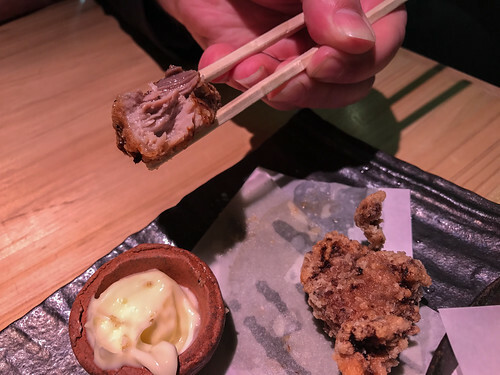 It’s not just the eating, it’s the whole experience of watching them being created on a grill in front of you, through to the final touches – sticky sauce topping and a sprinkling of nori (seaweed) or katsuobushi (bonito flakes, or dancing tuna flakes). 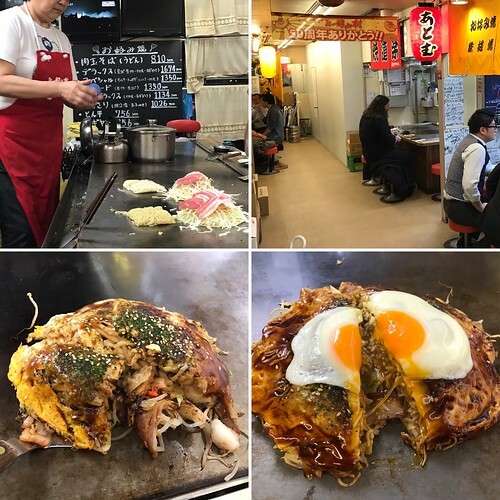 Okonomi-mura, a Hiroshima-style okonomiyaki food theme park at 5-13 Shintenchi in Naka-ku, Hiroshima, Hiroshima Prefecture, Japan. We visited Okonomi-mura (“Okonomiyaki Village”) an okonomiyaki food theme park in Hiroshima, in the early hours of 23 December. There are 25 food stalls on three floors, and most of the stalls have seating for about 10 people around the grill. Even at this time of night, they were all pretty busy. We found two empty stools and chose some saké and pancakes off the menu (it contained some English translations, and there was a bit of pointing and smiling involved). It’s a meal in itself, containing protein, carbs and loadsa veggies. At Okonomi-mura, they use their own type of sticky okonomiyaki sauce, specially created by Sun Foods. The sauce really finishes it off. These pancakes are sprinkled with nori (seaweed) and sesame seeds too. Yum. 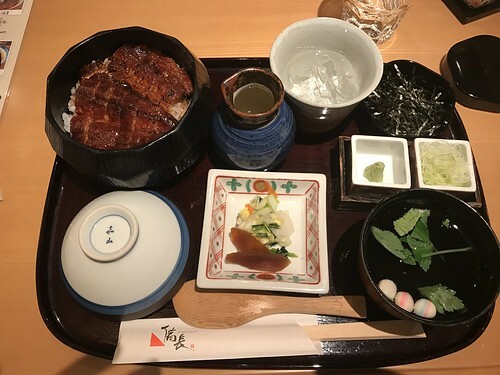 Currently rated 3rd of all the restaurants in Osaka on Tripadvisor, Kiji restaurant in the basement of Umeda Sky Building is well worth a visit. We ate here after visiting the beautiful Himeji Castle and grounds on 25th December. It was the middle of the afternoon and we waited in a seated queue by the door for about ten minutes. The restaurant is quite shabby-looking with walls covered in messages, memorabilia and paper currency from all over the world, along with Tripadvisor (and other) certificates of excellence. Here, we were first introduced to the highly practical Japanese storage benches, where your seat is a wooden box with a lid in which you can store your bags, coats, and umbrellas, and keep the limited floor space clear. Once seated and storage sorted, we ordered two cold Suntory ‘the malts’ beers (a nice, refreshing malty lager, as the name suggests) and two okonomiyakis – K chose mixed meat and I chose a pork (bacon) + seafood. 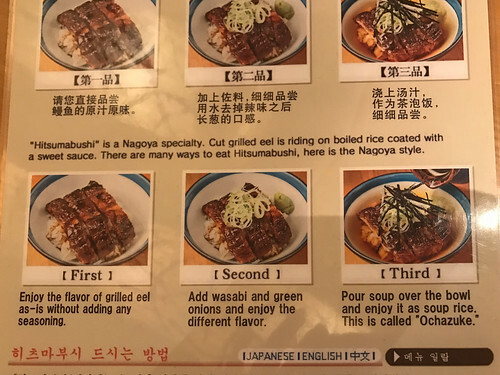 Here in Osaka, the shredded cabbage, mixed veggies and protein were all mixed up (rather than layered). And contained rice (rather than noodles). And coated in a gorgeous sticky brown okonomiyaki sauce. Double yum! Ignoring the slightly shabby surroundings, these pancakes get 5/5 for taste. Two beers and two pancakes totalled 3,690 yen (about £25.00). It’s our first day in Japan, having travelled overnight last night from the UK. Wandering the streets, we are tired and awestruck. Intrigued by everything. We’ve got a fairly easy day planned that involves leaving our main luggage at our hotel in Shinagawa, dropping off our snowboarding bag (that we’ll only need later in the holiday) in Ginzo, and visiting Tokyo Sky Tree in Sumida to get our bearings of this impressive city. 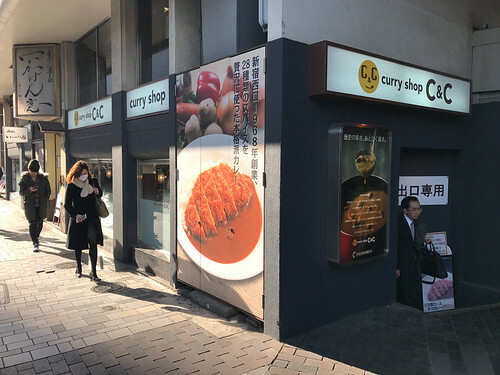 One particular smell grabs our whole beings as we walk along a street in Chiyoda – the smell of curry coming from C&C Curry Shop. We’re in raptures and head straight back here, once we’ve dropped off the snowboarding bag. It’s apparent from the start that some of the eating places here are tiny. And it’s not uncommon for them to only serve one type of dish. Many variations of it, but one dish nonetheless. Check out the menu for C&C Curry Shop (there are many similarly named curry outlets) – it includes sausage, cheese or even warm ball curry! all served with rice. 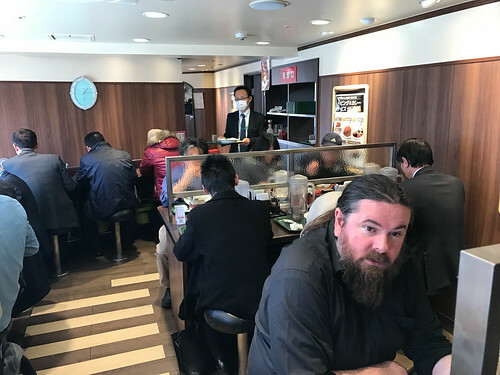 Entering the small restaurant, space was noticeably tight, with people (mostly on their own) squeezed in close together on stools along counters running right round the walls, appearing to be grabbing a quick but hearty lunch. Joining the queue at the canteen, we got trays, pointed to our chosen options, were immediately served and looked after by the abundant staff. Someone to give you the food, someone to point you where to sit, someone to bring tap water (and keep topping up your glass). Breaded pork cutlet with rice and pork curry – yum! It was formulaic, well organised. And very tasty. 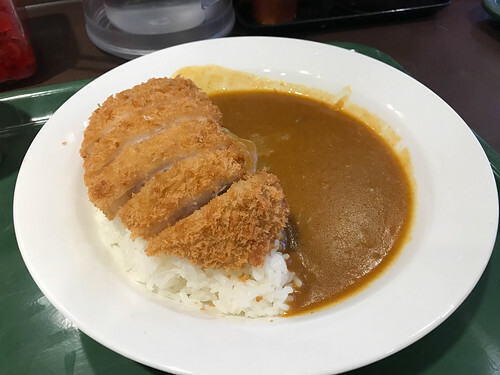 We both chose a breaded pork cutlet with rice, and a medium hot pork curry sauce which had plenty enough of a kick for me and I love hot, spicy food (choose between mild, medium hot or hot). At 650 yen (about £5.00) this was great value, and filling. Just your average curry menu? 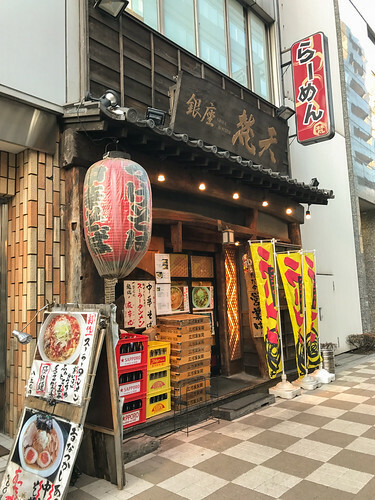 – curry options at this restaurant in Kyoto include: Cheese filled hamburger curry, soft boiled egg and chicken meatball curry, scrambled egg curry – food innovations you’d only find in Japan! 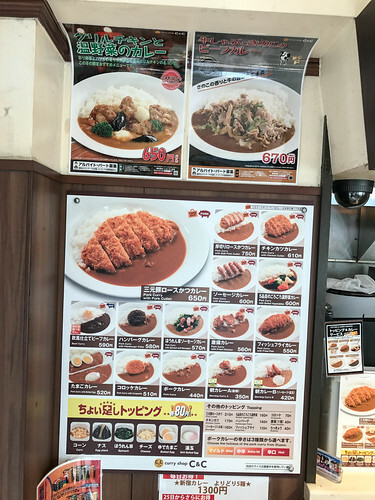 The verdict: Trying a Japanese katsu curry is a *must do* in Japan.